Recently there was a stink on the Internet about a woman named Clarabelle Rodriguez who tried to purchase a pair of designer eyeglasses online and got ripped off by an unscrupulous vendor. When she complained that the glasses were knock-offs and demanded her money back, the vendor not only refused to issue a refund but threatened her. As luck (bad luck, in this case) would have it, the algorithms Google uses to rank web searches placed the unscrupulous vendor high in their results. Remember, folks, Google ranks websites by their relevance and by how many other sites link to their content. It’s not an ethics filter. (They have, however, been busy revising their search algorithms to prevent incidents like this from happening again.) Had you searched for “BP” this past Summer you would have found millions of Web pages–most of them deservedly unflattering accounts of the oil gusher in the Gulf of Mexico. Nobody complained (except perhaps BP) because that’s what people expected to find. BP were the bad guys and we wanted every horrible, oil-soaked detail. This case is different. The vendor whose results ranked high for searches on “Lafont” was not at first known to be a bad guy. Rodriguez just wanted to buy a pair of glasses in a style she hadn’t found elsewhere. She searched, she clicked, she bought… I wasn’t there when she did, and I don’t want to shift the blame to the victim, but I think there’s a lesson to be learned here. There’s an old saying, “Fool me once, shame on you; fool me twice, shame on me.” Clarabelle Rodriguez was an innocent victim in this incident, but I’m sure she’s learned to be more careful. If you’ve been on the Internet for a while (and I’ll assume you have, if you’re reading this), you know there’s a lot of questionable material out there. There are also some jewels. Search engines such as Google, Bing, etc. can help you find information about topics you search, but they are not designed to rate the moral fiber of the site owner. That responsibility, in part, rests with the reader. Recall the BP example. If you had searched for “oil” last Summer, many of your top results would have been about BP’s Deepwater Horizon accident. Basing your estimate solely on the number of hits, without reading any of the pages discovered, you might have concluded that BP was a top-ranked company–the sort of business you might want to work for, invest in, or at least buy gasoline from. Wrong! We must learn and constanthttps://circleofignorance.wordpress.com/wp-admin/post.php?post=628&action=edit&message=1ly re-learn how to evaluate the search results we find and distinguish between the popular and the notorious. In this case, reading a few of the Google results and perhaps checking the Better Business Bureau‘s website might have turned up a warning. Or maybe not–scammers can be remarkably clever about hiding their tracks. But at least some of the time you might find enough red flags to make you re-think a purchase. It matters right now. Not only because this story has suddenly become hot, but because we are entering the holiday shopping season. It’s an ideal time for dishonest merchants to take advantage of harried shoppers. And we increasingly shop online–either researching products that we later buy in stores or buying directly through a website. Only a few years ago the term “Cyber Monday” was coined for the Monday after Thanksgiving, when most online holiday shopping happened. (That was way back when relatively few people had high-speed Internet access at home, so they shopped online when they returned to work on Monday.) Now I’m seeing articles about Cyber Week! Another thing that makes this important is the increasing popularity of smart phones and other mobile devices. They offer a convenient interface between the real world and cyber world–convenient for thieves, that is, who can lure unwary shoppers into brick and mortar stores that are every bit as dishonest as DecorMyEyes.com. 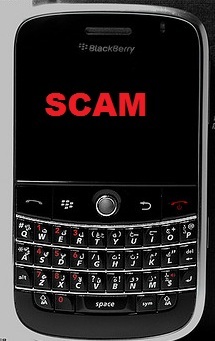 “There’s an app for that” but unfortunately it won’t show the word SCAM on the icon. You have to do a little research and figure it out for yourself.